My family recently skied Beavercreek mountain, CO for the first time. We went mid-march and experienced the most glorious spring skiing. We buy the a yearly ski pass called Epic Pass gives us unlimited skiing at great resorts in US & Europe (if you ski 5 days + its worth it). We flew from Orlando to Denver (4hrs) followed by 2.5hr drive with Mountain Shuttle to Beavercreek. You can fly direct from all major airports to Denver. If you can fly direct to Vail Eagle it is only a 30min transfer, Vail Eagle flights can be pricey unless you book way in advance. FYI Uber does not work in Beavercreek! We stayed in a 1 bed suite with kitchen & separate living room at The Westin in Avon and got the town shuttle to the mountain daily. The shuttle ride is only 10mins but we quickly got used to it and in fact it was a great way to meet people. Our kids made friends quickly on the bus and would plan their social hour with their new ‘shuttle’ friends. If money is no object stay on the mountain at The Ritz Carlton Bachelor Gulch or Park Hyatt, both are ski-in-ski out and are around $10K a night for a 3 bed suite. 8100 Mountainside Bar & Grill at The Park Hyatt (make a reservation through opentable). Mamie’s Mountainside Grill: At first we were not sure about grilling our own food but it was fabulous. We bought burgers (gluten free buns are served) and you grill your own burgers in a gorgeous setting on top of the mountain. Wine and burgers are a perfect pick me up. Our kids grilled smores for dessert. Mamie’s is top Bachelor Gulch Lift Express. Spruce Saddle: Casual lunch spot, canteen style. Quick pit stop, we had tacos & sushi. Ritz Carlton Bachelor Gulch: Delicious mountainside lunch spot. Powder 8 Kitchen & Bar: Base of the mountain. 4pm onwards live music by Shannon Tanner gets the crowd excited & they take requests via Venmo. Visit the mountaintop Candy Cabin! They have the best pick & mix! Many nights we got take out because we were tired, we enjoyed dinner by our fireplace in our apt. Pho 20 Avon: Vietnamese delicious take out. Pazzos Pizza: Eat in or Take out. They have gluten free pizzas. Blue Moose Pizza: Good pizza joint but super busy during holiday so expect a wait. Vin48: They were so nice to us as we never had a reservation. Food & service was great. Our kids loved the Beavercreek ski school. They made friends and loved their instructors who improved their skiing technique! At the end of the day staff walk round with trays of cookies, handing them out! We only put them in ski school for 3 days so we could enjoy 3 days skiing with them. Their apres-ski was Ice Skating in Beavercreek village, we sat by outdoor fire on comfy seating while watching them skate! Hope this inspired you a little trip to Beavercreek. Over the school holidays this summer I travelled to Paris with my kids (Olivia - 9yrs & Max 7yrs). During our four day trip, Paris captured our hearts and is now one of our favorite cities. Eurostar is fast & comfortable from London (St Pancras Station) to Paris (Gare du Nord) travel time 2hr 15 minutes. We bought standard seats which honestly were perfect. There are so many great shops at London St Pancras Station: John Lewis, Hamleys, The White Company. Once you arrive at the Paris train station: Gare Du Nord Paris it is short taxi drive to all the main hotels. Once in Paris we Ubered everywhere and did not bother with the subway. We stayed at the Westin Vendome, the hotel has a superb location opposite Jardin Tuileries which is a stunning park & playground. Our room was not huge but we were barely in our room, the bathrooms could do with a little sprucing up! If money was no object I would stay round the corner at The Ritz, mainly because I love this location especially for a short visit. A short walk from our hotel is my favorite shopping street - Rue St Honore (3 min walk), Place Vendome for stunning buildings great for photos (3mins walk) Louvre museum (15 minute walk) through Jardin Luxembourg. I love walking as much as I can around Paris, each time I gasp at the architecture and landscape. Breakfast - Cafe Florre Eggs, Cappuccino & croissants! Lunch - NOTE nearly everywhere will close service at 2pm or 2.30pm! Maison Maison Overlooking the Siene. There is a cute kids play area next door. Pizzeria Iovines delicious pizza, wine & salad. Round the corner from my favorite store Sezane. There are boulangeries on most corners. One day kids & I just grabbed a-to-go quiche, baguette sandwich and carried on admiring Paris! Hotel Costes: Perfect. Kid & adult friendly. Lovely setting and so easy for first night. Note - Buy tickets in advance and allow time for security checks! We did not buy tickets in advance and in the red hot sun we queued for an hour for some sights but was well worth it! Louvre - Beautiful! Kids loved the Mona Lisa but we also enjoy stunning setting, architecture and incredible curation of art. Admission free for kids! Eiffel Tower - Magnificent! We loved so much, truly one of the most stunning monuments I have every seen. The views are spectacular, we all have our own interpretation of a city but I loved seeing Paris through my kids eyes! We bought tickets for the elevator up & down! Notre Dame - Worth a visit, line moves super fast and is donation based! My kids recognized the the historiacal cathedral from the movie, The Hunchback of Notre Dame. This was super quick visit for us! Palais Garnier, Opera National de Paris - This was huge hit for all of us! They recognized this beautiful opera house from the movie LEAP, my kids remembered every scene from in Palais Garnier. Indeed an extraordinary building surrounded by the busy streets of Paris! Jardin des Tuileries - This incredible public park links you to Louvre Museum from our hotel The gardens were designed by the same architect of gardens at Versailles . It has playgrounds and the kids loved it. It also had a small pop up fun fair for the summer months which was a huge hit in the evenings for my two! During the Christmas months they have a pop ice rink and winter fair. Jardin du Luxembourg - Napoléon dedicated the 23 gracefully laid-out hectares of the Luxembourg Gardens to the children of Paris! Beautiful public park next to Luxembourg Palace, lots to do for the kids including playground and there is a pond in front of the palace where you can rent sail toy boats which they push round the pond using sticks! Cute kiosks selling ice-cream and coffee! Also a great place for a picnic! Arch de Triomphe & Champs-Élysées - One of the most famous boulevards linking to the most famous Arch. We did a drive by which was fabulous to avoid the sea of people. Le Bon Marche - Temple of Paris Department stores. Monoprix - Target of France, we stocked up on reasonable toiletries and cheap chic clothes for kids! Shop Rue St Honoré - My favorite shopping street. Isabel Marant, Bash, Goyard. These street is close to our hotel and Lourvre. Louis Vuitton Place Vendome Flagship Store is worth visit for the history and stellar views of Place Vendome. The building was designed in 1714 by a Versailles architect which showcases Paris artistry at its best. The store is magnificent and you have endless options of their incredible collection. They have an artist onsite who can personalize your Louis bags. Sezane - Gorgeous French collection which I covet online, so wonderful to view and buy their collection in their Paris store. My family adore Paris and can’t wait to visit with Christopher. Thanks for reading and sorry it took so long to write! Our family are just back from 5 beautiful days in Tulum. I was a little diva and did not want to wake up in my house on my 40th Birthday so we booked a trip to Tulum which ended up being a a wonderful 5 days in paradise. I have compiled our family recommendations, we are only sharing places we visited and tested. Good tip: Leave your heels and make-up at home! I travelled with Olivia (8) & Max (6) and Christopher flew from Orlando the following day to join us! A short flight of 3hr 20 minutes from JFK to Cancun we arrive in Mexico. I pre-booked a car service with Front Desk, they were a little more expensive but I really wanted a suburban I figured they were safe! The driver was friendly, car came with a TV & Wifi access, It took us 1.5hrs to get to Tulum. You can be spontaneous with most restaurants, if you are a large group I suggest making a reservation. Cenzontle - Mexican food, this was our first dinner out. Kids had quesidilla and chicken. I had fresh seabass & salad and super refreshing Ella Fitzgerald tequila cocktail. Great setting and service. Breakfast we went to the Real Cocunut based in the Sanara Hotel. We faced the ocean while eating a healthy delivious breakfast! The menu gluten, grain, dairy and refined sugar free but still delicious! Kids had the gluten & grain free pancakes, I had the perfect almond cappuccino and Very Berry Chia Parfait. This became our regular breakfast venue, the service was wonderful. Try and arrive before 10am for breakfast, before all the yogis finish practice and it gets a little busier. Posada Margherita: Our favorite lunch place was at our hotel, because it is delicious and setting is just incredible it is very popular venue for lunch & dinner. Gets busy, they don't take reservations and cash only. Gitano - Mexican fusion. Restaurant & Bar. Great atmosphere, superb service and food was incredible. Kids loved the Chorizo with Taco wraps. Christopher & loved the Octopus ceviche and slow roasted Pork Belly with crispy cabbage. We all demolished the chocolate dolce leche dessert! Nu Tulum - Mexican food. This restaurant only opened 2 weeks ago and was INCREDIBLE, was recommended to us by a local. Stunning setting, food had incredible flavors and cocktails were perfect! We enjoyed pork ribs in tomato sauce, quinoa rice and rib-eye steak. Kid friendly. Hartwood - This is an institution in Tulum and a reservation is much needed or you queue from Midday to catch a table for dinner. You can email a month in advance to make a reservation. All this hype what did our family think, loved it. The service was super friendly, the food was delicious. They are very kid friendly and have high chairs too. The menu changes daily but it is well worth making a reservation and enjoying their food, setting & excellent service. 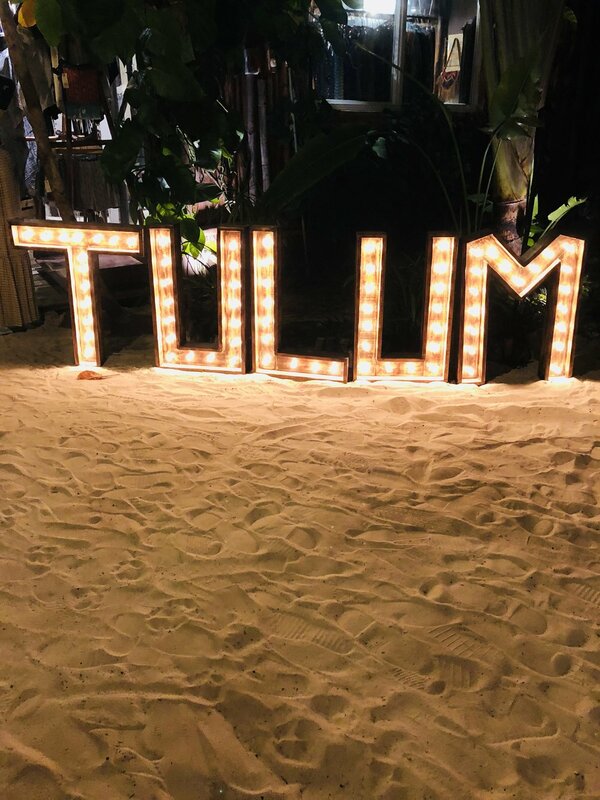 Mulberry Project Pop-up Tulum- This was recommended by a friend and this was the perfect place for my 40th bday drinks, super kid friendly, DJ on Monday night and stunning setting within La Zebra Hotel. The Mulberry Project is a Manhattan bar and they have pop-up bars abroad creating bespoke cocktails! Mur Mur - Mexican food, lovely place for dinner under a canopy surrounded by palm trees and lovely shops. Open kitchen, very cool seating areas and friendly service. Prep Hair I met canadian born hairstylist Chelsea owner Prep Hair. I got my usual single process done at her beautiful salon. Chelsea & her team do color, haircuts, blowouts, weddings and special events. They can travel to your hotel for a group booking. Tulum is magical, a great place to switch off and enjoy paradise. Olivia said all your need is a beautiful beach and the ocean! We can't wait to visit again. Many restaurants are cash only, try and get dollars or pesos at the ATM at the airport or at your original destination because the ATMs close to the above restaurants have high charge and bad exchange rate.